Nothing beats giant robots battling mechanized monstrosities across a desolate world. With FCI’s Magmax, your dreams of taking on the universe in this manner can come true. The story of the game is incidental to the action. 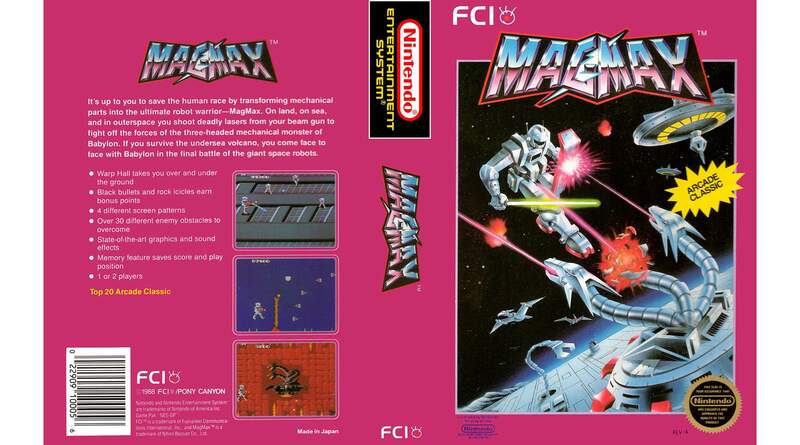 You play a fighter jet/spaceship that can build itself into a giant robot by collecting various parts to create the Magmax – the ultimate fighter robot. It’s sort of like Voltron, but without the lions. The action takes place on two planes—above ground and below. There are holes in the ground, through which Magmax can travel, where the perspective changes slightly. Underground is more of a sidescroller, whereas above allows for more isometric movement. It’s a neat effect we haven’t seen much on the NES, but seems almost superfluous. The graphics are a bit bland, with little detail or variation. Things look like what they’re supposed to be, but there’s just something lacking. The player’s robot looks great, as does the mulitheaded mechanical dragons that protect the end of each stage. Everything else is just generic and blocky. The levels have decent environmental variation, along with obstacles that provide an additional challenge. Speaking of challenge, Magmax certainly obliges. The game begins tough and doesn’t let up. Assuming you don’t have any robot upgrades, your ship can only take one hit before exploding. If you have the torso, gun, or legs of the robot, each hit zaps one of them, reducing the player to several weird-looking combinations of ship/robot hybrid. The robot upgrades aren’t even great. The legs seem to add nothing but an extra hit, while the body and gun provide additional (often useless) firepower. The challenge and general gameplay betrays Magmax‘s arcade origins. Controlling the game is simple enough. Movement is accomplished via the directional pad, while both A and B shoot your weapons. Scrolling is smooth and it’s fun to transform into a robot to blast your enemies, despite the challenge. The music has a snappy, upbeat quality to it that works for each level. Sound effects are a bit high pitched for my liking, but make sense. Unfortunately, this game suffers from largely forgettable music. Magmax provides some great afternoon fun, but I have no desire to return to its world after finishing it. Perhaps no surprise, but the arcade version provides a much better experience than the home version. They can’t all be winners. Magmax is a decent and challenging game, but unless you’re a huge fan of giant robots, there are better shooters out there. Life Force and Legendary Wings are two recent releases that more deserve your time and money.